I was in Madagascar for three days last week upon an invitation of the FES (Friedrich-Ebert-Stiftung Foundation) to make a presentation on Freedom of Expression and of the Press at a workshop and to meet with local journalists. It was an eye-opening experience to witness all the difficulties faced by the local population and the journalists as well as other actors of civil society. The political situation was very unstable and there were many crowd manifestations in town on the ‘Place du 1er Mai’ with some violent confrontations with the police resulting in many deaths, injured and arrests. Luckily, we were away from the hotel (which is just a few minutes walk from the hotspot) during the protests (which only take place between 11 a.m. and 4 p.m. according to a local friend). But, I did see the pictures and reports in the local press which were quite alarming. The workshop which targeted potential young leaders in Madagascar went on well with a wide variety of participants (from ministries, courts of justice, NGOs, private sector and the press). There were even mothers with their babies as the FES favours a gender approach and thus hosts the women participants and a nurse for their babies to allow them to attend the working sessions. The next day, we also met with some local journalists to discuss about press freedom in Mauritius and Madagascar. Many could not attend due to the political crisis, some had even been called by the Ministry for some explanations about their coverage of the protests. Journalists work under a lot of pressure and have very small salaries and virtually no safety net. One leading blogger journalist even said she had been interrogated once by the police for being suspected of allegiance to an ex-vice PM. Yet, paradoxically, though our press looks freer than theirs, they have lots of private TV stations whereas we have none. They have an ‘Ordre des Journalistes’ which we do not have. It would seem they have the proper framework but application is lacking and political tensions override the democratic system. Before the workshop, we visited the remains of Radio Madagascar and TVM, which were both burned down by rioters in January. 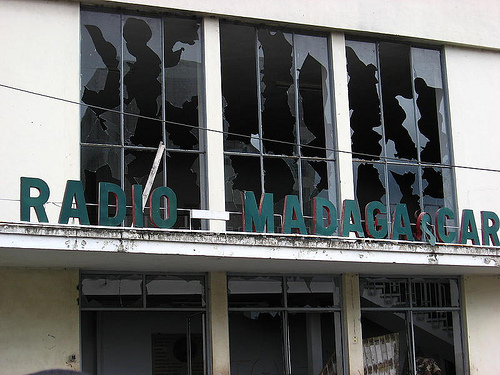 Radio Madagascar is not functioning any more as it is completely devastated but TVM is operating a minimum service with equipment recuperated from the presidential palace and personal equipment brought in by the journalists themselves. They had apparently just received state-of-the-art equipment a few months ago, which had been funded by a German organisation, all of which have vanished into black fumes.